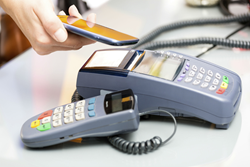 Smaller Retailers Will Pay the Price For Not Embracing New Payment Technology, warns SME Champion. With the arrival of Apple Pay and the imminent launch of the game-changing Samsung Pay App, ParcelHero says small retailers will count the cost of not adopting new payment methods. It shouldn’t be the case that only the major retailers gain the benefits of the latest switch in consumer behaviour. Savvy internet shoppers are enthusiastically adopting new payment technology to speed up payments and ensure their transactions are secure. Now the pioneering technology-led international courier ParcelHero says SMEs and start-ups must keep on top of changing trends to ensure they are not left behind in the build-up to Christmas. In the US David says Apple Pay, which generates dynamic security codes for each transaction, rather than reveal bank card numbers, is extremely popular in stores like Macys and Bloomingdales, which have welcomed the system. Google Wallet – soon to morph into Android Pay - is also popular amongst security conscious buyers.